Cloud Comfort will make a lasting impression of extreme comfort with all of your clientele. The 2" thick pad of memory foam wraps itself around the body in a gloriously posh and and supportive way. 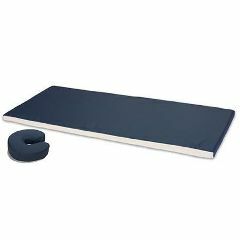 Also check out the versatility of the Cloud Comfort Pad by using it on the floor for bodywork and as a deluxe yoga mat. The top of the cover is made of a wipeable vinyl, while the bottom is made of a soft flannel. Package includes foam table pad, plus Stronglite face rest pad. Pad measures 2" x 73" x 30".